A new study by the American Medical Association challenges the assumption that young drinkers are more resilient than their elders to the harmful effects of boozing. Not so, Richard Yoast, director of the AMA's Office of Alcohol and Drug Abuse, told CBS Radio News. "Children who started drinking before the age of 15 had a much higher risk of having long-term life-long alcohol problems and alcoholism than those who began drinking after that," he said. "The brain is still developing up until the early 20s. In fact, the adolescent brain is less resilient than the adult brain." "Our brains go through important transformations during adolescence," says Sandra Brown, Ph.D., chief of psychology services at the Veterans Affairs Medical Center in San Diego and whose brain research is included in the report. The AMA report, Harmful Consequences of Alcohol Use on the Brains of Children, Adolescents, and College Students, examines two decades of scientific research on how alcohol alters the developing brain and causes possibly irreversible damage. On average, children now try alcohol for the first time at the age of 12, and nearly 20 percent of 12 to 20-year-olds report being binge drinkers (having 4-5 drinks in a row). "It can certainly interfere with their learning abilities," said Yoast. "It affects areas such as memory and learning and a lot of thinking skills, for example." The AMA report also shows adolescent drinkers scored worse than non-users on vocabulary, visual-spatial and memory tests and were more likely to perform poorly in school, fall behind and experience social problems, depression, suicidal thoughts and violence. 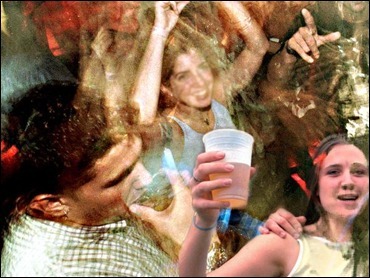 The AMA study also found that young drinkers are at high risk of suffering "possibly irreversible" brain damage. The AMA is asking cable stations and television networks to stop airing alcohol commercials targeted at youth. In particular, it asks broadcasters not to air alcohol ads on programs that air before 10 p.m. or that have 15 percent or more underage viewers, or air commercials depicting mascots, cartoons or other characters targeted to younger viewers. "It's time TV executives and the alcohol industry stop profiting at the hands of those most harmed by drinking," said Dr. J. Edward Hill, chairman of the AMA. A recent nationwide poll conducted for the Robert Wood Johnson Foundation found that nearly 70 percent of Americans favor a ban on TV liquor ads and 59 percent support banning beer commercials on TV.